Tart, juicy, and so happy, the pomegranate arils dance in the bubbles! Have your antioxidants and drink them too. 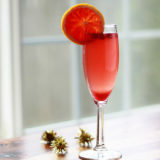 With these Blood Orange & Pomegranate Champagne Cocktails, it’s possible! Though I have to admit, antioxidants weren’t really front-of-mind when I decided to make these. I was thinking more about the pretty colors and bountiful flavors. Blood oranges bring a slightly tart, almost concentrated orange flavor to the table (though this can also depend on the specific oranges you get). And pomegranate juice gives it that signature juicy jolt – almost raspberry in flavor. Combined, you’ve got a fancy pink, sparkly cocktail on your hands that tastes as good as it looks. I tend towards Prosecco when making champagne cocktails because overly-sweet sparkling wine isn’t really my thing. But I have to admit that a teaspoonful of sugar (or, to be more champagne-cocktail authentic, a sugar cube) really makes it when using a drier wine. You could also start out with something sweeter and skip the wine – like a Moscato. Make it yours! 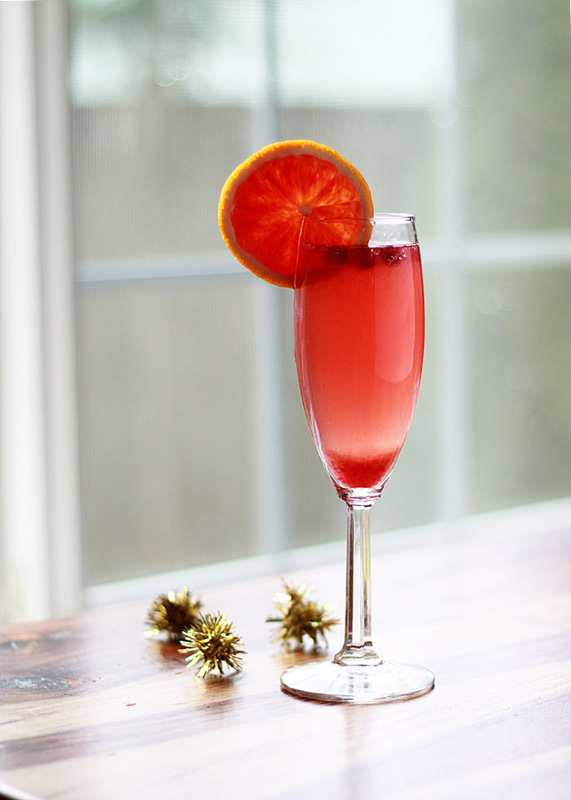 I can’t decide which part I’m more in love with – the gorgeous over-the-top blood orange slices, or the way the champagne bubbles make the pomegranate arils dance around while you’re drinking it. Or, you know, the champagne cocktail itself. 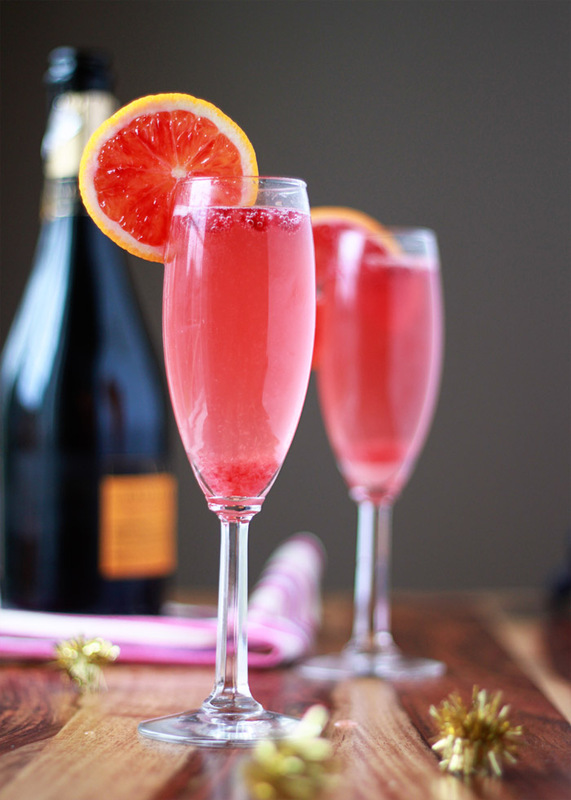 Lively, luscious, sparkly pink – and a little health boost, while we’re at it. 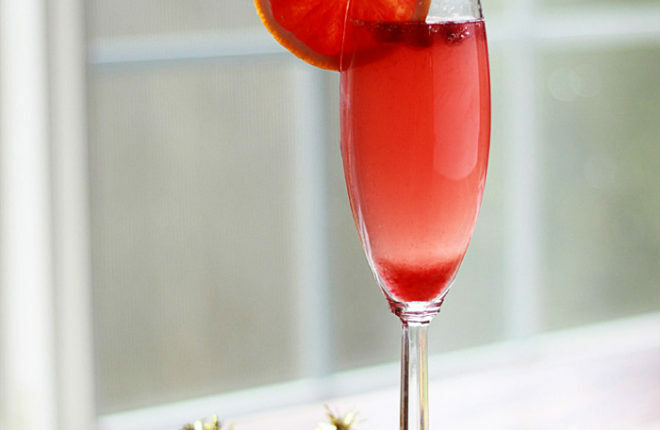 This little champagne cocktail has you covered. Set out 4 champagne flutes - if they're chilled, all the better! Divide juices between each glass (about 1 tablespoon of each type of juice per glass). Add sugar, if using, and stir until dissolved. Fill the cups almost to the top with Prosecco. Pour slowly - there will be fizz! 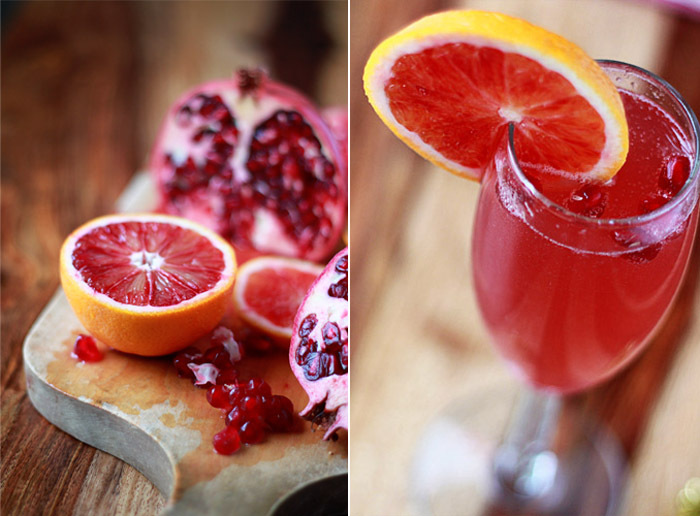 Drop in a few pomegranate arils and top with an orange slice. Serve. Mmm these sound so good, and they look stunning! I’m adding this to my to-do list! As it happens we grow both pomegranates and blood oranges here in south Georgia. This is a perfect use for them, with Barefoot Bubbly moscato champagne!